Sour Candy Balls- four flavors grape, strawberry, orange and lime. Hard sour-fruit candy balls. Wake up your taste buds with these spectacular sour bites of fruit, packaged in a �milk carton� container. Four delicious flavors: grape, strawberry, orange and lime. Ingredients: Sugar, glucose, citric acid, artificial flavors, candelilla wax, artificial colors FD&C: Yellow 5, yellow 6, red 40, blue 2. 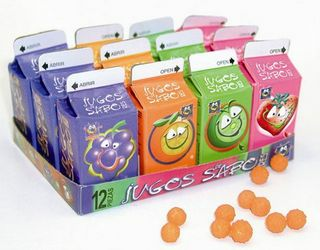 Caramelitos de Sabores- cuatro sabores uva, fresa, naranja y limon. These are small hard candy that are sour once you crunch into them. 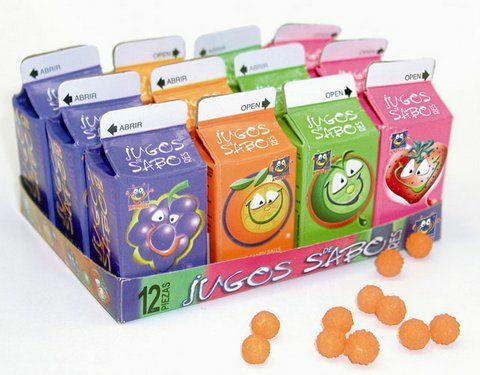 The novelty bit of them is that they come in small milk like cartons. Fun nostalgia candy for those that remember it and maybe a new treat for newcomers. Be mindful to watch over youngsters that eat them as they are small and are considered a chocking hazard.